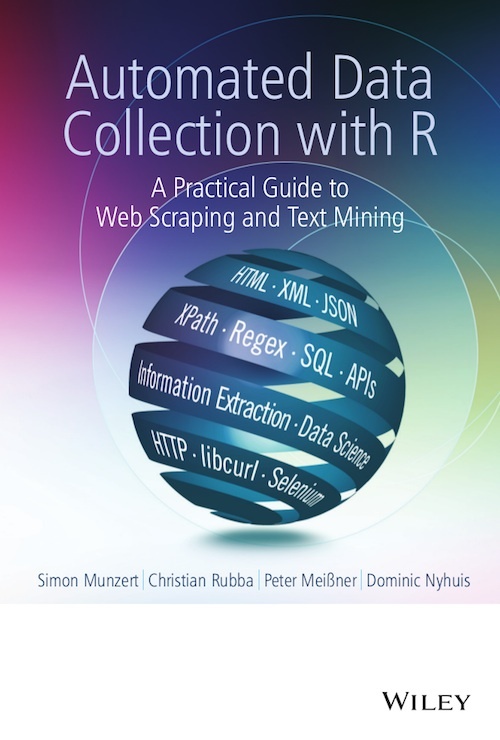 Presents a practical guide to web scraping and text mining for both beginners and experienced users of R.
Explores basic techniques to query web documents and data sets (XPath and regular expressions) as well as technologies to gather information from dynamic HTML. Demonstrates how to connect to web services/web APIs and collect data in a regular manner. Features case studies throughout along with examples for each technique presented. Provides a multitude of exercises to guide the reader through each technique. R code and answers to questions posed in the text featured on this website. Visit our blog to read more about all things data collection with R. We post regularly on text manipulation, databases, Web technologies, Web Scraping, and further topics. In R, of course. We also tweet regularly under RDataCollection on a wide spectrum of R and data collection specific topics. Learn data collection techniques with R from Matt Loftis at the Essex Summer School in Social Science and Data Analysis (24.-28. July 2017). Register now! Automated Data Collection with R is now available in Chinese! 玩得开心! Register for an introductory course to learn web scraping with R at ECPR Winter School of Methods 2016 in beautiful Bamberg, Germany. Register for an introductory course to learn web scraping with R at ECPR Winter School of Methods 2015 in beautiful Bamberg, Germany. The E-Book version is now available from the Wiley online shop. A guest post on web scraping with R on the predictive heuristics blog.